How Does InsurTech Affect Insurance Brokers? Raised by (if I may put it this way) family relatives called FinTech and RegTech, InsurTech combines both ‘insurance’ and ‘technology’ to sum up the use of technology innovation designed to automate efficiency in the current insurance industry model. The same way as in other industries, the powers of technology are changing the industry’s landscape by enabling new services, products and opportunities. What does it take to succeed in this changing environment? How do InsurTech companies affect insurance brokers? There’s that sort of recurring line across various industries: will technologies take away the jobs from us, people? Oh, the fear of the unknown. First of all, let’s be clear with definitions. Perhaps the verb “to affect” is not the right choice of word in our case. “To help” would be a better pick here, and we’ll explain it later. So before plunging into details, let’s check some technological novelties that are changing the insurance industry as a whole. AI and automation will have a significant impact on business outcomes in fields such as customer experience, operational efficiencies, cost optimization and market competitiveness. Artificial intelligence will also influence the emergence of new business models. The blockchain technology will provide secure data management across the multitude of interfaces and stakeholders in a way that without losing the integrity of data. It will affect the management of insurance business operations from A to Z, or, if to be specific, from underwriting to claims processing. Robotic Process Automation (RPA) will provide better data processing. IoT devices and sensors will help insurance professionals to improve risk assessment and price policies based on real data in real time. This way, customers will be more likely to buy policies to prevent possible losses. New accounting systems for doing calculations and reporting. 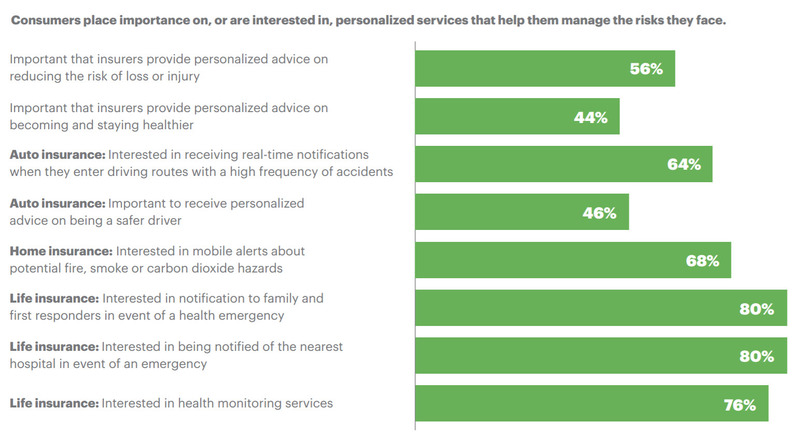 Now it’s clear that, instead of competing, technology and insurers can help each other. But surely the industry professionals will have to fully engage in the process, they should change their way of thinking and learn. Ideally, they should be the driving force behind the creation of ecosystems that span from,say, healthcare to real estate. The industry professionals must adapt to this new reality and find their new roles in this new environment. The role that will assist them in adding value, that’s the point. It would be fair to say that nowadays the number of InsurTech companies is rapidly increasing. According to the report by Startupbootcamp InsurTech and PwC, there are more than 1,300 startups from across the world focused on the insurance industry. For big insurance companies, the benefits are pretty much clear: InsurTech makes their processes more efficient and enhances customer interactions. Apart from the rise in the total number of applications, Startupbootcamp InsurTech – the leading accelerator of startups supporting and scaling companies innovating and disrupting the insurance sector – has reported an increase in applications from bordering industry domains as startups realize that the insurance sector is ready for innovation. In 2018, 61% of SBC applicants came from adjacent industries. Let’s compare the numbers: in 2017, 75% of startups came from within insurance, while in 2018 80% of the group represented the other domains. This way, the trend towards collaboration is already tangible. Again – what exactly does InsurTech mean for ordinary brokers? On one hand, the technology may provide them with an array of opportunities but on the other side, not each and every broker can start using it right away. Sometimes people are just scared to learn something new. So the legitimate question arises. What’s next for InsurTech domain? The industry welcomes innovations, for sure, and that’s the good sign. The modern consumers have unlimited access to information, so they are ready to purchase their insurance policy online. Fair enough, at the moment, the number of such deals is relatively small, but there’s a growing trend of customers getting more and more digitally influenced no matter what industry we’re talking about. People are searching beyond traditional means to be better informed. Secondly, if there’s a need for new ideas and solutions, we won’t see the shortage of startups willing to achieve commercial success in the insurance domain. And returning to the question in the headline, the ones who accept the progress will benefit from these changes like no other.